I realize William Shakespeare as business guru may be an unconventional interpretation of the poet and playwright. But why not take inspiration where you can find it? Shakespeare’s legacy persists across these many centuries precisely because his words lay themselves open to discussion, enjoyment, and usefulness despite changing contexts and time periods. Each generation, different people read Shakespeare anew and find fresh purpose and meaning in these enduring, familiar turns of phrase. 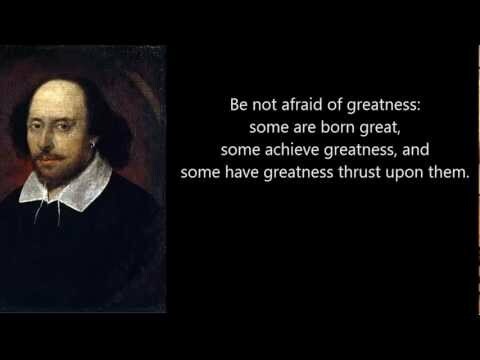 Courtesy of the Bard, here are 10 quotes to use as memorable motivators and robust reminders for yourself and your teams. Whether running a meeting or giving a speech, be a standout speaker by keeping it short, sweet, and striking. Enough said. The breakneck pace of our world today sometimes leads to injudicious decision making. There’s everything to be said for being nimble–but rushing for the sake of proclaiming agility is foolhardy. Be measured. The time spent thinking through all possible scenarios and consequences is well spent–whether it’s considering a difficult conversation with your boss or a new pitch to a prospective client. A good, solid rationale–backed by data and experience–most often encourages the best outcomes, in business and in life. Don’t get so married to an idea that you have to work hard to justify it. The best strategies, ideas, and plans are supported by powerful foundations of fact. Use introspection to shine a light on yourself as you are right now–beauty spots, warts, and all. But also maintain an unshakable belief in yourself. Know that with hard work and perseverance, you can become more–even much more–than you are today. This is perhaps the most perfect summation of the entrepreneurial spirit you could read. Conquering the mountain is sweet, but the real satisfaction comes from the struggle up to the pinnacle and the progress you make along the way. Some deals really are too good to be true. Trust your instincts–if you get a bad feeling about a person you’re dealing with, even if you can’t pinpoint precisely why, pump the brakes. Do more due diligence. Call people. Get more information (then more and more) until you know for sure if your instincts are borne out or wildly off target. When you’re deep in the day-to-day details, it can be hard to remember how all the tasks and work set before you will add up to something bigger and better. Our momentary frustration often robs us of the ability to believe in the big picture and keep going. This excellent expression of optimism reminds us that even small things have a mighty impact. If you’re a leader, patience is particularly essential. It’s important as you listen to a nervous junior team member describe a new idea, or hear an explanation by a senior lead whose project is not going well. It’s a quality you need as you consider the direction of a company or team–and what must happen to get where you want to go. It’s useful in the day-to-day scrum of business life, when it helps you let go of the little irritations that threaten to derail and deflate you. Excuses are weak. When you mess up, own up. Be remorseful about the mistake or transgression–and be energetic about making it right. This is true for the midlevel manager, the brand-new hire just out of college, and the CEO. We’ve all met business boors before–full of bluster and boast, offering very little substance to back up their assertions. But sometimes it can take time to identify one on your team, particularly if they’re exceptionally persuasive and easygoing. Key signs to watch for: a person who always has a great idea (or 10) but can never seem to execute. Is there always one reason or another for the lack of progress? Big promises of great things on the horizon? Time to start a serious conversation. Whose words do you find inspiring?